Amanita Muscaria (Fly Agaric Mushrooms, Amanitas), the highly visible and strikingly beautiful mushroom, also known as the Fly Agaric, is yellow to red in color and speckeled with white. Amanita muscaria is probably humanity's oldest entheogen. Amanita muscaria's history has it associated with both Shamanic and magical practices. It was identified as the "Soma" of the ancient (4000 BC) Rig Veda by Gordon Wasson. So, Amanita Muscaria has historical use as far back as we have history, and it shouldn't be hard to suppose that prehistoric humans, in their activities as hunter/gatherer, recognized that there were mushrooms and other plants that had benefits not related to hunger. Our ancestors must surely have been intrigued by the Amanita muscaria--they appeared magically from nowhere, in strange and beautiful shapes and colors and gave magical visions of the beyond when eaten. Today Amanita muscaria mushrooms are widely known : the Alice in Wonderland mushrooms, the fairytale mushrooms regularly seen in fairy tale books. Yet most people aren't aware that they are, in fact, real. A must have addition to any ethnobotanical collection. Are mushrooms the real food of the gods ? Does it contain a hallucinogenic substance that was known and used by ancient cultures and its priests to gain access to the World of the Gods ? 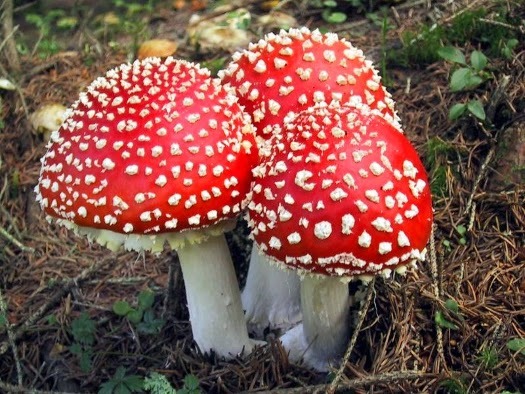 Amanita Muscaria, the “red with white dots” mushroom is not only the central setting of many children’s stories; for the American author James Arthur it is the “mushroom that created Mankind”. It comes close to identifying the mushroom with god, but such a literal identification is out of place. What Arthur is suggesting, is that what typifies Mankind, can be found in the hallucinogenic properties of the mushroom. The Amanita Muscaria is not only famous for its appearances in fairy tales; its colours are also linked with Santa Claus, racing through the skies with his reindeer. Is it a coincidence that reindeer eat this mushroom, and that it grows under the trees we seem to largely grow for Christmas tree purposes? One of the first researchers to draw attention to the hallucinogenic purposes of the mushroom was Andrija Puharich. Puharich worked for the American government and is specifically famous for his involvement with the psychic Uri Geller, who he brought to the United States for testing. Puharich learned about the hallucinogenic mushroom through his mediums, specifically the Dutch Harry Stone, who spoke and wrote ancient Egyptian while he was in a spontaneous trance. He identified himself as Ra Ho Tep, an Egyptian priest from the times of the pyramids. He described a ritual that centred on mushroom worship. He claimed that the mushroom was worshipped in ancient Egyptian times for its hallucinogenic power, allowing entrance into another dimension, the dimension of the Gods. The Egyptian Underworld was named Amenta; the mushroom was named Amanita. Coincidence? Perhaps. What is clear, is that the Egyptian Book of the Dead makes numerous references to food of the soul, which allowed Mankind the opportunity to meet with the Gods. Stone told Puharich that the Egyptians labelled this substance “the plant of life”: ankh khut. The ankh-sign is the predecessor of the Christian cross. It is the symbol of life. The symbol also resembles the shape of a mushroom. Are mushrooms “stargates”? Arthur believes he has identified symbolism in the Mithras cult that depicts such “stargates” and which form a link between mushrooms and religion. Like many mystery traditions, the cult of Mithras involved an initiation, as well as sacred meals. Were mushrooms eaten during such meals? Puharich asked Stone what exactly an initiation into the mushroom cult involved. Stone replied that this involved “opening the door. Enter it. Disappear through it. But it is only for those who know”. Stone spoke of a blinding light, a thundering sound and an amazing speed which propelled him to various places, at each of which he received specific information – knowledge – mostly about the future. The presence of a stargate was the central premise of an early 1990s movie, Stargate – later reworked into a television series. The use of the stargate in the movie is largely identical to the description given by Stone. But Stone’s stargate is not a physical structure – it is a mental structure, a mental landscape, created by the mushroom. A key section of Stone’s description is his ability to enter that dimension and receive information. Is this the mechanism that might have allowed the ancient Egyptians to successfully build their impressive monuments? Did they delve into a pool of knowledge? Perhaps. Without being able to positively say “yes”, it should be clear that the concept of the pyramid and the first building of one, was an idea of Imhotep, who was a priest. And though we should not take Stone’s claims at face value, he does suggest that there was a mushroom cult in ancient Egypt at the time of the pyramids. Arthur and Puharich are not the only ones who have asked these questions. Terence McKenna believed that the use of hallucinogenic substances was the best method to access other dimensions. Those who had used, had witnessed God. “Direct knowledge” in Greek means “gnosis” and here we are back to our link with the many mystery schools, who largely promoted this concept of “direct knowledge” of the divine. Gordon Wasson was another researcher who was deeply intrigued into this type of mushroom. 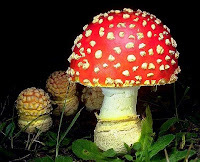 He stated that Amanita Muscaria was the true Soma, the divine beverage of the Vedic and Hindu tradition. He underlined both his own work and that of Puharich when he identified a tribe in Mexico that was still worshipping the mushroom when he made contact with them. This was an important breakthrough, as many of his colleagues had labelled his theories as “improbable”. The same was concluded about the existence of mushroom-worshipping tribes. 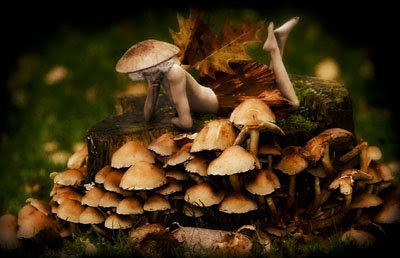 The oldest depictions of hallucinogenic mushrooms are 7000 to 9000 years old. They are rock engravings in the Sahara, in the Tassilli. Here is a sequence of people that are dancing. Each dancer holds a mushroom-shaped object in his right hand. Two parallel lines radiate from this object, towards the central area of the dancer. Later, people would be depicted with two horns there. It was furthermore this image that inspired the Swiss author Erich von Däniken to label these people “Martians”. Whereas they do not show aliens, the rocks do show an ancient mushroom cult. It also shows that the mushroom cult was present in a region which has been identified as a key location in the rise of civilisation. It is also important to note that rock markings as a whole are considered by archaeologists as aspects of initiation rituals, and thus part of a religious doctrine. It seems that the evidence argues for just one conclusion: from our earliest known history, there is a clear parallel between the presence of a mushroom and religious ceremonies… to the Gods – via the mushroom ? Greek civilisation knew the Temple of Demeter, the Goddess of the Earth, at Eleusis. Philosophers such as Aristoteles, Plato and Sophocles partook in its rituals. These were the participants in the “Elysian Mysteries”, the contents of which have never been written down, even they continued to exist until well into the Christian era. They were amongst the thousands of pilgrims who made the 20 km long voyage between Athens and Eleusis, in which huge amounts of money were paid for the privilege to partake in the yearly ceremonies. From a hidden, central room in the temple, a substance derived from mushrooms was given to the participant. They remained in the temple for the duration of one night, but left in the morning, “forever changed”. Was the mushroom the centre of the Egyptian civilisation? Puharich states that the Egyptian language does not have a word for mushroom. Does this imply the Egyptians did not know of them? It seems unlikely. Though the mushrooms needs humidity and trees to grow and Egypt might not seem an ideal candidate to offer either, Egypt’s current climate is different from that of 4000 years ago. An alternative suggestion is that they did know, and that it was indeed the “food of the gods”, which they often do refer to as “what is it?” – a food that allowed direct communication with the gods. It is known that the priests made sure that the secret of how to contact the gods was kept hidden from the general public. Perhaps it was merely a secret because of the scarcity of the mushroom and that it was felt that its use should be the sole privilege of the priesthood. So, the absence of evidence, might in this case be the best evidence of presence… for the “food of the god” was one of the best – if not the best – secrets of ancient Egypt. Soma is more likely to be the psilocybin cubensis than the amanita muscaria and its alos possible to be a mixture of pyschedelic plants or another pyschedelic plant and this is still a mystery but psilocybin cubensis is the best guess. Terrence Mckenna explains all this in a whole chapter in his book "food of the gods" and how Gordan Wasson was giving into favoritism with the amanita. Also saying that the amanita is probably humanities oldest entheogen is naive, psilocybin cubensis is more likely, according to terrence mceknnas book food of the gods humans evolved from apes by taking psilocybin cubensis.